This Mojohand trademarked design T-shirt has a Front print on a high quality, cotton Black tee. 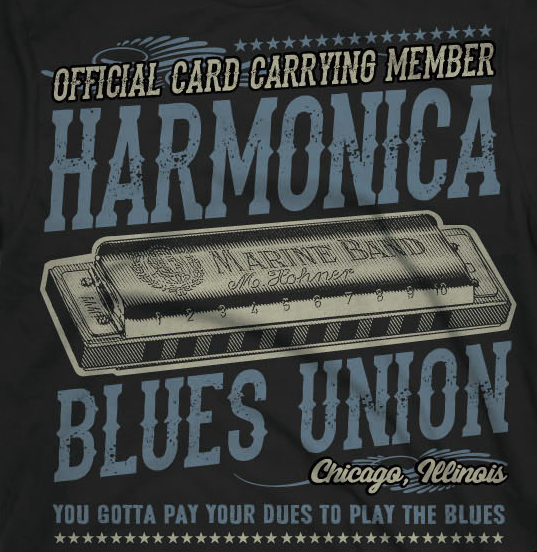 Perfect for the Harmonica Players! Mojohand is the original Blues gift shop, often copied but never matched in quality or service… Blues stuff by a real Blues musician and artist… not some faceless corporation just looking to make a buck. Ships Worldwide. Foreign orders have a one time surcharge for the entire order, you can see your countries price before you enter payment info.